It would be 7:AM. My alarm clock would ring and from the warmth of my comfortable bed in Battersea, I’d make my way to work and proceed through the day within the hustle and bustle of London. I enjoyed it, London is a fantastic City and a good home to me. I had a job I was motivated about and in that life, I had wonderful friends and a close family around me. Yet for some reason, I was tired. Feeling somewhat emotionally & mentally drained, I decided to buy a bicycle. I hadn’t cycled in 10 years, nor did I have a bike – but I was inspired by my friend, Dan Harrison, who had already set off on the Better Life Cycle charity adventure, a project we had both worked on from its early stages. I flew to Sharm el-Sheikh in Egypt and our cycle got underway from the very moment I landed. Though 40 & 50 degree temperatures I had a lot of adjusting to do – both from the prospect of being on a bike and living out of panniers, to adjusting to the required level of fitness to keep the momentum up. The Sahara Desert saw vast expanses of desolation, sand storms and blistering heat. But it all came coupled with the hugely warming presence of Sudanese hospitality, which ranks as some of the warmest in Africa. 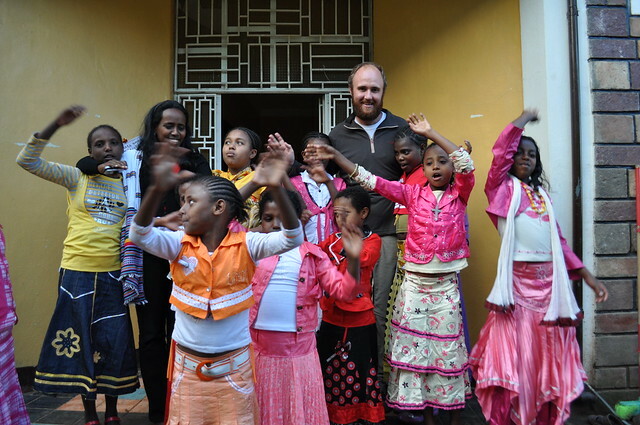 The surroundings changed dramatically in Ethiopia, and in Gondar Dan & I got involved with Yenege Tesfa, a wonderful project helping street children in the local community. As planned, I cycled solo after Gondar taking in projects in Kenya & Uganda before pedalling through the mountains towards Kigali. I arrived with a shock; nothing bad, but I hadn’t seen traffic lights in a while, let alone ones where people actually stop! And then countdown timers? Goodness me. I was delighted to meet Meg, even if it was after a “mini-adventure” getting up the steep climb to the colourful gates of the Meg Foundation, as the Kinamba Project is locally known. I felt very welcome and awoke the next morning to the patter of excited children running around the compound. The morning starts with a rendition of the Rwandan national anthem swiftly followed by a variety of other songs warming up those ever-so-excited vocal chords. My background and most useful skill comes in IT, so we talked about ways I could help. I was delighted to be able to migrate fundraising over to Virgin Money Giving, take on Website Administration tasks and assist with documents, logos and anything I could get my hands on. We toured Kimironko market through vast arranges of Kanga and other, equally vibrant materials. Africa enjoys and exudes colour in a way unlike no other place I’ve visited. In Kenya, I had been lucky enough to volunteer alongside Minalyn at Life Beads Kenya, a project helping vulnerable Women and Street Children build a better life through bead work, sewing & jewellery…so I knew the basics, not that I’d know what to do if you put me in front of a sewing machine! We purchased fabrics, accessories and other bits to assist the local co-operative, who carefully make not only School Uniforms, but items for selling both locally and back in the UK. They provide not only a vital money earner, but instil the sense of earning a living rather than relying on foreign assistance – an act and understanding that is critically important for the sustainable development of any Country. Better Life Cycle has also taken up the sponsorship of three wonderful children, whom Dan & I are ever so proud of. There are many ways to help any project; but ensuring young, bright childhoods receive a caring and well thought out education is the very best we can hope for. With the recent history that Rwanda precedes itself with, nothing felt more appropriate. After two weeks working at Kinamba, taking in Kigali and enjoying time off the bike, I headed further south to neighbouring Burundi where I worked at the Orphanage of Hearts project, before cycling onwards though Africa. On July the 1st, after two years and two months on the road, I eventually made it to the Cape of Good Hope where, for the first time since May 2010 I was reunited with my family. It was an amazing moment that provoked many emotions. Since that event, time has allowed me to reflect and mentally prepare myself for return to the UK. But it’s my time at organisations like the Kinamba Project that not only leave such wonderful memories, but keep my inspiration alive to continue this support. Whilst my ride may have now ended, my support and motivation has not. I can’t wait to return to Kigali and visit everyone at the Kinamba Project. Not sure I’ll travel by bike though, think I might just take a plane next time.